They have been serving their signature dishes for the past 28 years at their humble space in Rainham, Essex. With both returning regulars and new faces every week, they do their very utmost at making everyone feeling at home - the true Turkish way. You can also enjoy the food in your home with take-away available. Yildirim and Huseyin Esiroglu come from Kusadasi in the Aydin province of Turkey. Growing up with their mother's love of cooking, it was only natural for this passion of food to passed onto them both. Combining their authentic Turkish recipes along with other methods & ideas they picked up along their travels in Europe; the brothers, along with Yildirim's wife Sharon, have put together a menu with true character, passion and soul. This menu they have created helped them win the Archant London award for best Modern European restaurant in both 2008 & 2009. The sounds of Turkey fill the airwaves of the restaurant floor every night of the week. From Baris Manco to Tarkan to Mustafa Sandal - you can hear all of the greatest Turkish artists to accompany your food. 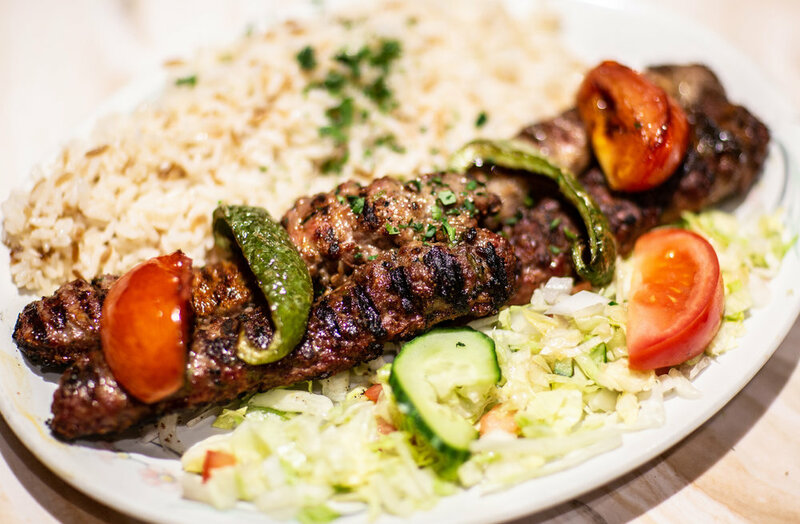 At Kusadasi Taverna, we don't ever like to see you leave so stay for a drink and a dance after you finish your meal. Party until the early hours on a Friday and Saturday night. Join us on Saturday evening's and experience one of the most beautiful and oldest parts of Turkish culture with our belly-dancers. Dating back to the earliest days of the Ottomans, belly-dancers used to perform for the Sultans and nobles of the empire. There's no better way to get into the party spirit. Being the chef of the family, you will often find Yildirim in the kitchen working hard preparing the award-winning dishes. He may seem stressed at times, but that’s when he cooks best. Compliments to the chef are always welcome too! The heart of Kusadasi Taverna is truly portrayed with Huseyin’s friendly and welcoming personality. Knowing most of the regulars on first name basis, he is an expert at making the guests feel at home almost instantly. Holding everything together and keeping tabs on the boys is Yildirim’s wife, Sharon Esiroglu. Being a crucial part of the team for the past 27 years, you will find Sharon behind the bar at Kusadasi Taverna making drinks and cocktails.